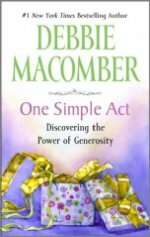 I’ve been listening to the audio version of Debbie Macomber’s book, One Simple Act, on giving and I conclude that you can free yourself by giving. Before listening to Mrs. Macomber’s book I had been reading a self-help book on success or finding your right life (I’ve been in a getting-life-in-order fix so I can finish the book I’m working on) and the life coach said that she had a client who could not relax (not be a workaholic) until she had $20 million. The woman made it to $20 million and then wanted more (so she could relax). You gotta be kidding me. $20 million? If I had been that woman’s life coach, I’d have told her to give some of that 20 million away. Give freely. It wouldn’t be easy, but I think it would release her from her anxiety. I’m reading another book, First Steps to Wealth by Dani Johnson(ABC’s Secret Millionaire). This millionaire gives away all but 10% of her income. That’s where I want to be–to be able to live comfortably on 10% of my salary so I can give away the rest. Hey, we can all dream, can’t we? There is a video malfunction in this message(the video camera went to a screen saver because it hadn’t been moved for a period of time), but the audio still works, so I didn’t edit out the bad part. I remember wanting to go home so I could cry. My head hurt from trying to keep my composure. And then, instead of going home after work, we had plans to eat at my husband’s parent’s house. So, I couldn’t cry then either. Today, I cry as I watch the documentaries of the tragedy. 10 years later, I cry. One of my favorite ministries is Gideons International. Every year we have a man representing the organization come speak to our church. I love hearing the testimonies of lives that were changed by simply reading the Bible. That little book has power. I’m grateful to those men who volunteer their time to see that the Word gets in the hands of people.